For years I’d felt like a part of my body was missing … because my teeth were. My dentist told me that dental implants would make me feel and look a lot better. OK, I said. Now, I’m thrilled. I can smile, eat anything, and enjoy a good laugh with my friends. Dental implant placement is a team effort between a periodontist or an oral surgeon and the restorative dentist. Dr. Vahey performs the actual implant surgery, initial tooth extractions, and bone grafting if necessary. 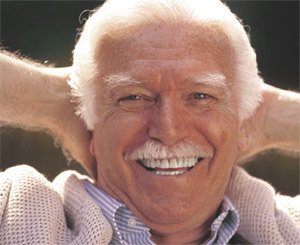 The restorative dentist (your dentist) fits and makes the permanent prosthesis(crowns, bridges or dentures). Your dentist will also make any temporary prostheses needed during the implant healing process.